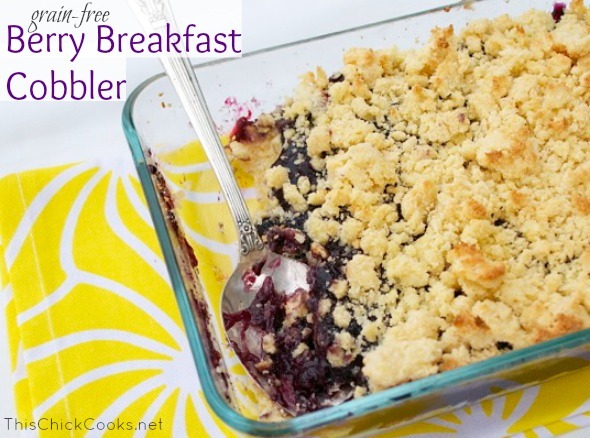 This beautiful and berry-licious breakfast cobbler comes from Katie at This Chick Cooks. It’s just one of the many delightful recipes featured in the “Healing Candida with Food” cookbook by Paula Miller of Whole Intentions. In fact, 25 real food bloggers have contributed more than 130 healthy whole food recipes in an effort to assist Paula with her vision to create a comprehensive resource for those seeking to heal from candida. And although I don’t strictly adhere to a candida diet protocol, I’m honored to be one of the real foodies featured in this book, sharing some of my most popular dinner recipes as a means to help others on their real food journey of healing. I must say that I found this book fascinating. It’s not only an excellent compilation of real food recipes, but also a thorough educational resource – walking readers through a step-by-step method for understanding the impact of candida and how to best combat it through a proven candida diet protocol. The book itself is based on the three-stage candida diet plan formulated by noted naturopath Dr. Eric Bakker, who’s been successfully treating candida for more than 20 years. So if you’re interested in learning more about candida, or are simply looking for a collection of real food, low-carb, low natural sugar recipes, then I encourage you to pop over to *Whole Intentions to learn more about this helpful resource. *Disclosure: If you opt to purchase this book using the link in this post, a small portion of the sale goes to support The Nourishing Home at no additional cost to you. There is no obligation to purchase, but if you do, you are helping to support the free resources, meal plans and recipes here at The Nourishing Home. Thank you! This wonderful recipe comes from Katie at This Chick Cooks, and is just one of the many healthy recipes featured in the “Healing Candida with Food” Cookbook. Preheat oven to 400 degress. Lightly grease an 8x8-inch baking dish with coconut oil; set aside. In a medium saucepan, over medium heat, mix together the applesauce, honey and berries. In a small bowl, whisk together the arrowroot powder with two tablespoons of water. Then add the arrowroot liquid to the berries and stir well to combine. Bring the berry mixture to a simmer and cook for 3-5 minutes until berries soften. Then remove from heat and allow filling to cool a bit. In a medium bowl, make the coconut crust by whisking together the shredded coconut, eggs, butter and salt. Then use a spoon to stir in the coconut flour until mixture is well combined. Press half of the coconut crust into the baking dish. Pour the berry mixture over the crust. Then use your hands to crumble the remaining crust over the berries. Bake for 12-15 minutes, until top is lightly golden brown. Makes a delicious brunch side dish, or serve it for dessert with a scoop of vanilla ice cream. A Closer Look at My Journey & Our Favorite Fruit Crisp Recipe! Thanks for sharing, Kelly! This is one of our favorite dessert recipes from the cookbook! Oh no! I think we’ll be having dessert for breakfast. Wow, this looks amazing. Any suggestions for what to use instead of coconut? The recipe sounds great but my kids won’t eat shredded coconut. 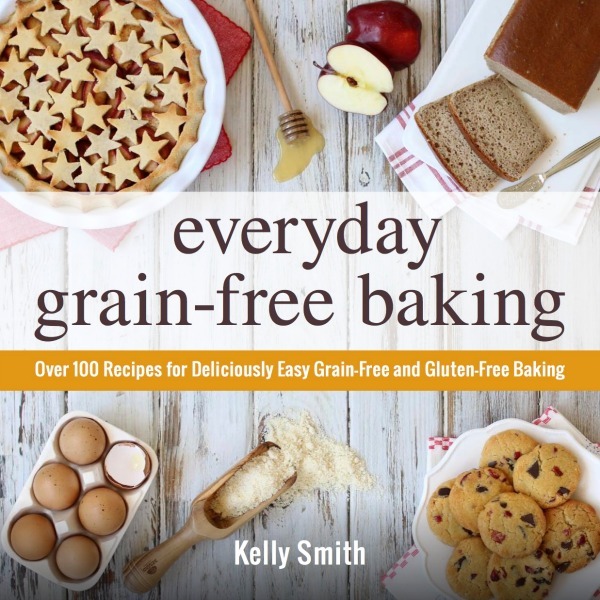 Kelly, you make amazing stuff with coconut flour!!! i need to put some of your recipes to use, i have a ton of coconut flour! This sounds really good. Is there anything that I could substitute for the eggs in the coconut crust? This sounds yummy but I’m not a real fan of shredded coconut. I wonder if you can substitute all coconut flour ? What an awesome recipe! Pinned! I added a bit of cinnamon to the crust and lemon juice to the blueberry mixture with good reviews from the eaters. Thanks for the recipe!! This was delicious. We made it as a first day of school breakfast treat! Thank you! Love your site-I just discovered it this morning! I don’t do GF or grain free so was wondering if I can sub regular flour for the coconut flour? I may be ordering some though, so don’t give up on me yet! This sounds yummy, and it’s on the menu for the end of the week when we will have company in town. I would love to go ahead and make it before they come and just pop it into the oven in the morning, but how do you think it would hold up to making ahead? Would the crust just be mush? Thanks for a great recipe! Hi I was wondering if I could make this and freeze it? I’m trying to find recipes I can freeze because were bout to have our first baby and want to have stuff premade. I want a good cup of fruit per person so im double or tripling this for breakfast, using stevia glycerite & doubling applesauce inste ad of honey. Goin with the sliced almonds instead of coconut too. Served with yogurt on the side and probably scrambled eggs. Looks great!